The moon, being the closest astronomical body to Earth, has a profound effect on us. Just like the moon's phases affect the ocean's tide, we are affected by the lunar cycle. This isn't too surprising as our planet is made up of approximately 70% water, and so are we. We are influenced by the moon as it waxes and wanes. Some report dreaming more vividly during a full moon. Nurses and police officers will tell you they experience more emergencies and incidents under a full moon. Women's cycles are called Lunar Cycles because they are 28 days a part. Our bodies are fine tuned by the celestial bodies that surround us. The moon represents the feminine, emotional, creative and nurturing aspects of our lives. During the new moon, the sun and moon are in alignment which means the sun hides the moon from our view. This is a time to go within and be honest with yourself about what you want to manifest into reality. The new moon is dark, this can be seen as representing our subconscious. What is hiding there that we need to bring into the light? The magic of the new moon is that it represents new beginnings. It's a great time to begin new projects, initiate important conversations, plant seeds and set intentions. Tomorrow we have a Solar Eclipse in our Pisces New Moon, this is a huge celestial follow-up to the Lunar Eclipse in Leo's Full Moon just 16 days ago. While the Leo Full Moon brought expressive energy forward into manifestation, this Pisces New Moon reminds us that in order to evolve we must appreciate the darkness with the light. Balance between light and dark, yin and yang is homeostasis, which is necessary for life. Tomorrow kicks off a six-month energy phase until the eclipse season comes to a close on August 21st. Solar eclipses provide an energy boost to manifest the new beginnings we have been working so hard to create. It is a time to be attentive to our soul - listening to and trusting in our own intuition and wisdom. The magic of the New Moon and Eclipse arriving together empowering us to release old trauma so that our painful past can be healed. Pisces personifies surrender and release, which means any desire to control or manipulate our circumstances must be resisted at all costs. As we let go of old wounds from the past we have less need to try to control the future. Space automatically opens up for new, healthy and loving experiences. Our attention must be on breathing and receiving. Pisces rules the ocean, so like the ocean we are learning to let the waves come and go. During the New Moon we are invited to be renewed and cleansed. To let the water wash over us instead of fighting against the current. 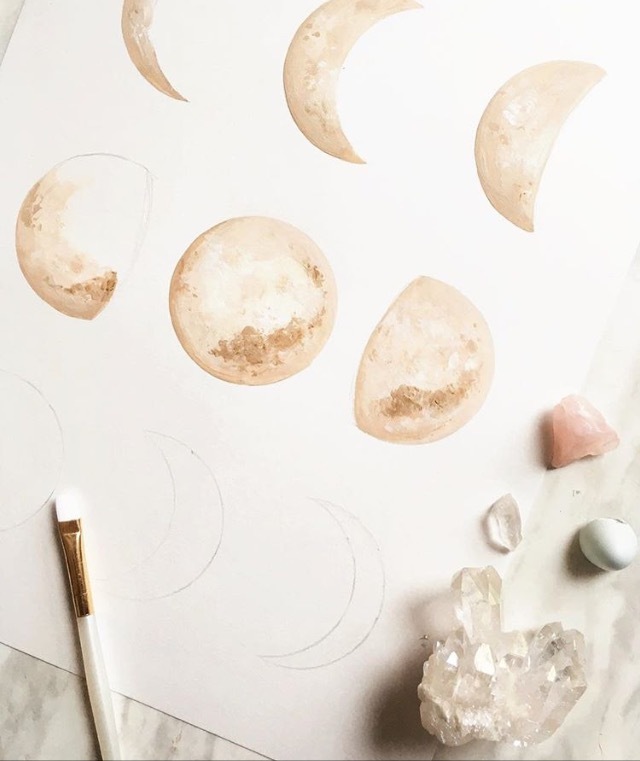 Today we prepare for the New Moon by identifying what needs to be released and setting our intentions of what we want to receive. What old wounds are you still nursing? What part of your life are you still trying to mold or manipulate to gain a certain outcome? What are my intentions for the coming days, weeks and month? What do I want to see manifest in my life as we move into Spring and Summer? Oh and if you love the artwork featured in this post head on over to see more of Katelyn Morse's artwork on Etsy!